I hate to think it’s may and we are still having snowstorms. I imagined by now the weather would be move warmer and progressing into spring but the opposite seems to be happening. I can’t wait for the temperature to reach 50 degree at least. Can’t wait for the first spring breeze; it’s so close yet so far away. Another good thing I’m looking forward to in the spring/summer is losing weight. During the winter we eat so much and never really get much exercise; I always put on a few pounds every winter. I’m trying to incorporate a little bit of skinny recipes here in and there into my diet in order to trick myself into shedding a few pounds before winter is finally over. 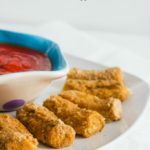 I baked these skinny mozzarella sticks yesterday and let me tell you, they are one of those kind of recipes that you can’t believe it’s a low-fat recipe. Why? because these mozzarella sticks taste so damn good! I don’t even know why I would make a full-fat version even if I was not on a diet! In order to keep the cheese from melting you need to place the string cheese in the freezer for 30-45 minutes. After that I coated them with eggs and bread crumbs, baked for 7 minutes and ate them while they were still nice and cheesy. You can actually prepare these ahead of time (bread them) and place in the freezer and than pop in the oven as needed. They will be frozen solid which will insure they don’t melt while baking. Cut the string cheese in half ( which makes 16 pieces) and place in the freezer for 30-45 minutes. Beat egg in a small and set aside. In a separate bowl mix the Parmesan cheese and breadcrumbs and set aside. Dip 1 string cheese in breadcrumb mixture than in egg mixture and than back in breadcrumb mixture. Repeat this for all the pieces. Place sticks on a greased foil or pan. Return the cheese stick back to the freezer for at LEAST 30-45 minutes ( Do not skip this step because the cheese will melt if they are not frozen). After the cheese is finished freezing heat oven t0 375 degrees. Spray the cheese lightly with cooking spray and place in the oven. After 4 minutes flip the cheese sticks and continue baking for another 3- minutes or until they are golden. Do not overbake because the cheese will melt. Serve Hot with your favorite marinara sauce. Enjoy! I am learning to freeze pre-prepped foods. 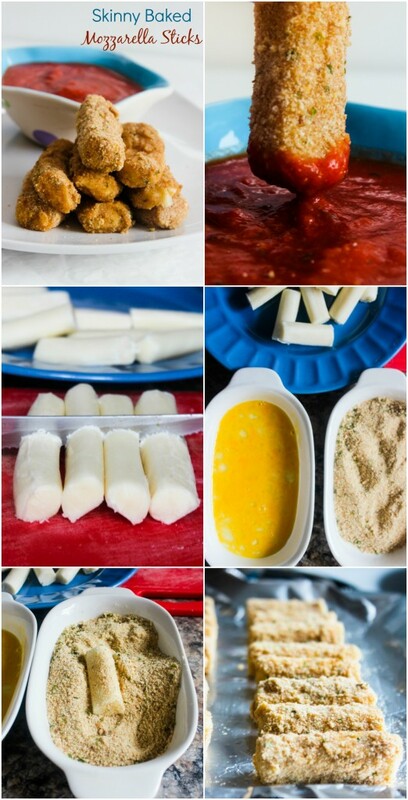 I see freezer mozzarella sticks all the time. if i wanted to freeze these and heat them later as a quick snack, do you recommend just freezing them after dipping them in the eggs and bread crumbs, or cook them all the way through and then freeze them for use later? I love that you actually respond to your posts! I have had a big issue with that on other sites unfortunately. Thank you! these look awesome! and side questions. Do you think this would be a good item to send it my child’s lunch as long as i get them good and hot in the morning so they could be cool enough for her by lunch time? Thank you Nicki! I would recommended breading them first and freezing them so they are crunchy and fresh when you bake them. I usually bread everything (chicken breasts etc..) and place them in the freezer and in the morning I bake them for the hubby and they last well past lunch time. Let me know how it works out! Skinny mozzarella sticks are always welcome!! This look so good Layla! My family goes gaga for mozzarella sticks. I love the baked part! Less grease, less mess, less calories. Beautiful! I learned the freezing the cheese before cooking tip the hard way… let’s just say it wasn’t pretty, haha! These look great! oooooh these do look perfect!! why fry em when you can make them so delicious like this! What a seriously awesome idea! I always prefer the skinny version of stuff like this, because then you can eat more. That’s allowed, right? Hello, Layla. What a lovely simple but delicious idea! I’m not sure we can get string cheese over in Europe but I think I could cut some long pieces from a block of mozzarella. Why not?! Yes of course you can do that! You would have to freeze them for a while though. Also, if you don’t have the sticks I usually make Mozzarella bites with block cheese; You cut the cheese into 1×1 squares and it’s the same process. The little bites are delicious! These baked Mozzarella sticks look droolworthy! This looks amazing I wish I could taste it right now! YUM! such great appetizers! love these sticks! 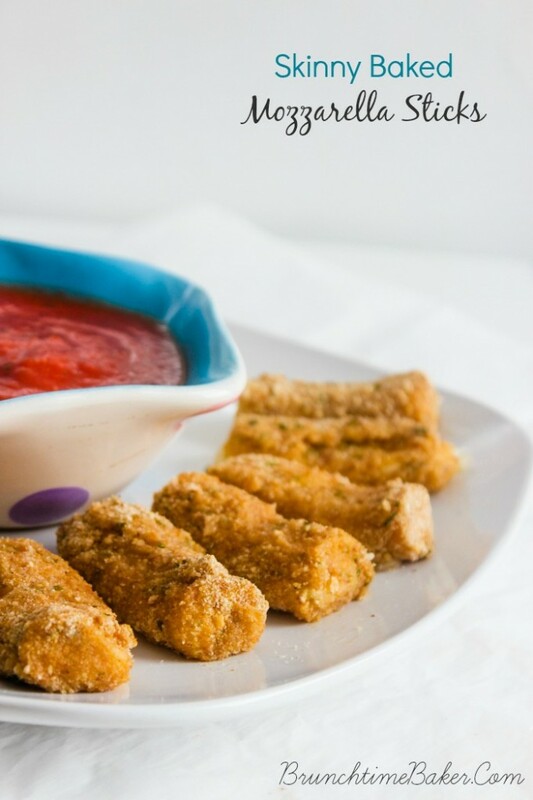 I can never say no to a mozzarella stick and these look absolutely amazing! I hear ya on the weather front – we have 40 degree weather coming later this week and I am thinking HEAT WAVE! (that’s just sad). Thanks for sharing the delicious recipe! Yeah it’s pretty sad how happy we are about 40 degree weather! It’s better than 0 for sure so we might as well enjoy it! These look fantastic. I think I would eat way more of these than I should. it’s like you know that deep down inside I’m still a chubby 8 year old trying to break free!! lol these look so delicious and SO easy, loving it. Aren’t we all! Thank you Christine! I’m sure your going to love them much better homemade! The last time we got a hint of warm weather we rushed to use or grill. It had been covered in snow for so long it was impossible to get the cover off! We just have the wackiest weather this year, spring will be very welcome if and when it gets here 😀 These mozzarella sticks would be a very welcome addition in our kitchen. Everyone loves mozzarella sticks here and I love the skinny aspect of these! I can totally relate to you Cindy! last week the weather hit 50 here and we ran to the park and it was filled with people; everyone was so happy the weather was warmer but now it’s back to snowy. I have a stove-top grill that I use all winter, I don’t know how I could have survived without ti! Mozzarella sticks are definitely a weakness of mine! Who can say no to melty, crispy cheese?! These look awesome! Would never know they are “skinny”! Yay for skinny recipes which look better than the real thing! These sound fantastic, and I’ll have to try them soon. I’m sure your going to love the Consuelo! Skinny recipes are more than welcome my dear! It’s not that cold here in London but still…. winter makes lazy every year. so yeah, I need all the inspiration with fun, healthy recipe’s I can get! I have always assumed that it was cold in London just like in New England (East Coast, U.S). I guess it’s because they always show it cold and cloudy in the movies!